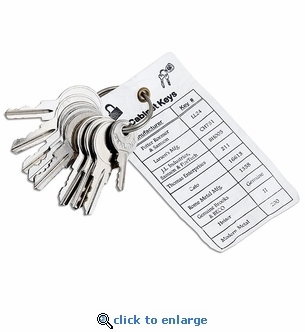 This set of 8 auxiliary extinguisher cabinet keys will open Brooks, FireTech™, Cato, J.L. Industries, Larsen's, Modern Metal, Potter Roemer, Rome Metal, Samson, Heiser, and Thomas Enterprises fire extinguisher cabinets. Set includes a durable cross reference tag for easy identification. This set is a great addition for property and safety managers.